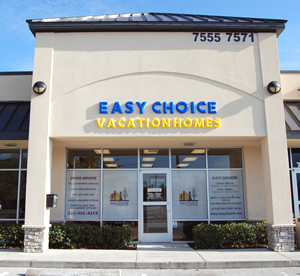 Let the Easy Choice Guest Services team make your stay here in Orlando, Florida an relaxing and enjoyable experience. Through our knowledge of the area and by teaming up with local companies we are here to make your vacation planning easy! Before you arrive you can give us a call or visit us at our welcome center and let us know what you need and we're here to make your Orlando vacation unforgettable! . We can help with Discount Attraction Tickets, advice on your park visits, arranging special occasion packages for your arrival such as flowers and champagne, baby sitting services, advice on dining in Orlando for all budgets, dinner reservations, additional maid services and more. You are always guranteed a warm greeting in our welcome center. You can use our state of the Art Google TV to check-in online with your airline, print out your boarding passes, read about and view Orlando Attraction reviews and videos, check your e-mail and even take a look at our website to book your next Orlando Vacation with Easy Choice. Our Guest Services Team is here to answer your questions and help you plan the best Orlando vacation! Call us on +1 321-401-4215 before you leave or or come see us at the welcome center when you arrive! By booking with our discounted Orlando attraction tickets partner, you can SAVE BIG on all of your Disney World, Universal Studios, Sea World and other Orlando area attraction tickets. Simply order all of your theme park tickets by clicking Kissimmee Guest Services! Use the discount code "easy"
Easy Choice Vacation Homes and our Quality Control team ensure you arrived to a perfectly cleaned home. If you are staying a while or have alot of family members staying with you, why not choose to use our optional maid service to order a mid-stay clean. You can do this adding to your booking option when making a reservation team, or by contacting our guest services department. Our house keeping department can arrange to clean your home or condo while your out at the parks, out for dinner, having a day by the pool or at convenience. We are very proud to offer all our guests the Express Check-in facility at all our Orlando Vacation Homes, Condos and Town Homes. No need to drive to our office after a long flight or drive, you can go straight to your vacation rental property and gain access by a simple key lock box. We let you have this information and directions to the rental home well in advance of your arrival. Easy Choice are proud to be a family run company and with that in mind, we aim to make everybody happy. Travel planning takes a lot of work in the best of times, but traveling with a baby brings so many new concerns. Don't feel too overwhelmed, Here at Easy Choice with a little time and some careful planning we can help traveling with your baby fun and stress free. Below you will see a number of baby products available to hire for a small charge. All items can be pre-booked and set up in your home for your arrival. The Angelcare Baby Movement & Sound Monitor AC401 is a 2-in-1 monitor for complete peace of mind. It includes a SensorPad and a voice-activated sound transmission with adjustable microphone sensitivity, both of which can detect your baby's softest sounds or slightest movements. 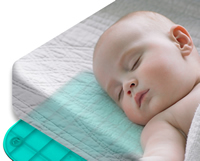 SensorPad will sound an alarm if no movement is detected for 20 seconds. Combining two frequencies and 8 channels it provides optimal sound quality and minimal interference. The parent unit is portable and rechargeable and has a full colour digital LCD screen that shows all the available functions, settings and even the temperature in the baby’s room. If you are traveling with a baby and you would like a ful size baby bed with mattress, this can be delivered and installed in the home for you. 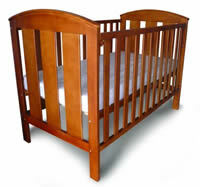 It fully complies to all safety regulations, has a good quality mattress and fresh, clean bedding can be provided. You can hire a baby chair for your stay. It makes feeding time safer, easier and much more fun! 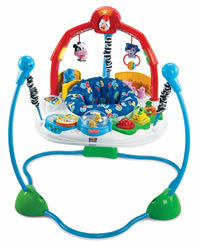 There's a lot of sights and sounds for your little explorer to discover in the Rainforest Jumparoo from Fisher-Price. The bunjee type bouncer has 5 different toy stations above and below and the 360º adjustable rotating seat allows baby access to them all. Baby's jumping efforts are well rewarded by a series of lights and movements set off by a sensor. The Jumparoo pivots to a nested position and so can be tucked away when not in use. 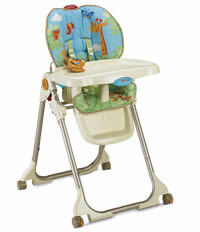 It is suitable for babies who can hold their heads up unsupported. This electric bottle sterliser can be waiting in your vacation home for you. This means you only need enough bottles for your travel plans. There’s a space for everything inside … purpose-built slots for six bottles, teats and even dome tops as well as space for the tube attachments from the Closer to Nature anti-colic pus bottles. There’s a single push button which glows orange when switched on and goes off when the cycle is finished five minutes later (allow three minutes to cool down). And as if that’s not enough, the steriliser contents now stay sterile for a full 24 hours provided the lid remains closed, giving parents the chance to switch it on at bedtime – and remove clean bottles at breakfast time.